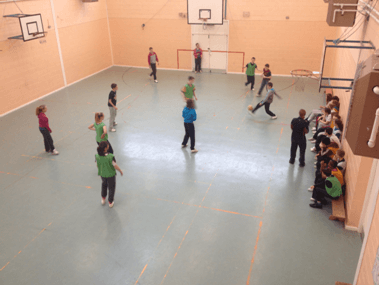 FGC Secondary School in Bunclody, Wexford required refurbishment of their School PE/ Sports Hall during the School Summer Holidays which included replacement of the epoxy flooring . Prior to installation Larsen undertook repair to large Movement joins in the hall. 220m2 of Resin flooring was laid over an existing epoxy resin floor. utilising Remmers PUR D60 which is a flexible, solvent free, two component coating on a polyurethane base. This creates a seamless, slip resistant surface suitable for Sports halls and offers the advantages of fast installation with no odour. Larsen completed the required court line markings using Meon two part epoxy colours.